I'll say I've never actually had an issue flying FLL to mostly BWI, MDW and LAS non stop. However the stress of the possibility on LAS is always there even in group B due to the 57 people in family boarding. BWI and MDW are short enough that if I was separated from my wife it wouldn't be the end of the world. Sorry but your dead wrong as I have flown two 777 ETOPS validation flight with "Pax" in the aircraft. I think perhaps my wording is/was misleading as the passengers in this case were actual employees of the airline, not paying passengers trying to get to their destinations, as that would be cruel. Sort of like evacuation drills, if you like. There has be someone in the cabin for there to be the necessary crew interaction. Having said that anything could be possible in the case of SWA validation flights. WN isn’t a new airline. There have been airlines younger than WN get into the HI market. Doing something 20 years after it was first accomplished is not something to rave about. Goodness gracious you would think they landed on the moon. I just hope their pilots understand the rules of Class II and oceanic airspace. There are no short cuts and you have to fly the assigned Mach number. Leave your cowboy boots and hats in the closet. This is not something to take lightly. I don't get it either, but it certainly is a thing. Read flyertalk sometime, and you will see the amount of obsessing about seats (and not just on WN) is crazy, especially for an airline that only has economy. I'm failing to see how the WN product is all that much different than AS, who seems to just fine to the islands. Gotcha, its astounding. The only questions I have with WN to Hawaii are the flight times since they historically dont do redeye's and of there will be any marginal service enhancements. I think they will do fine in the market overall. When does N8329B head back? Flightradar24 doesn't have any filed flights until DAL-AUS tomorrow. WN 8725 is scheduled to depart at 9am local HNL - DAL. Rumor has it WN will offer elevated snack service specific to long haul Hawaii routes, as well as limited inter-island beverage / snack service. AS has assigned seats, premium economy, first class, power at every seat (AC and USB), multiple meal and snack options, mileage redemption with over a dozen airlines worldwide, Satellite wi-fi with over-ocean and streaming capability for customers currently being installed. Both have free streamed entertainment. AS has hundreds of free movies. SW has free checked luggage (to a point). Anything I'm missing? This happens more than people realize. If you have over 30 business select fares and/or enough people who decide to upgrade their boarding position then you're possibly already in the B group. Then you have to compete with the other "early birds". Depending on the flight early bird can be a waste. Boarding anytime after family boarding the chance you'll be separated from your party increases. Maybe there are a few more differences than I made it sound like. However, my personal experience was very similar flying these two airlines last summer (CMH-OAK then OAK-OGG). I didn't have an assigned seat on WN and I paid for my bags on AS, but other than that virtually identical. I sat in a coach seat on a 737 for several hours and occasionally streamed something to my ipad (AS's movie selection was nice). The flight attendants came around and offered drinks. Ironically, I paid for both with points transferred from UR. They flights were much more similar than they were different. Of course, that is just my perspective. And if you are in F, it is different, but you were probably never flying WN anyway. But wait, half the people in this thread claim that fares to Hawai'i are already super-low. Are you saying that's not true and that it's not a price-driven market? We also have numerous claims that customers are already loyal to HA and AS and have their credit cards for the free checked bags -- are these the customers taking once-in-a-lifetime trips? Carriers like UA have "evolved" their service to Hawai'i so that it's basically identical to what WN offers on a flight like DAL-HOU or LAX-OAK -- a non-alcoholic beverage and a bag of snack mix/pretzels -- except that UA offers snack boxes and meals for an additional upcharge. But apparently WN plans to offer complimentary snack boxes on the Hawai'i flights which will likely be comparable to what's available on UA for the bargain price of $9.59. And most of these things carry an extra charge. Not every passenger wants to be nickled and dimed on their way to or from their vacation. No it doesn't. There are only 15 BS fares sold per flight. You do have A listers who could push the beginning of early bird to B, but usually it is in A. I think early bird is almost always a waste. All the seats are economy! If you check in at T-24, you will be able to sit with your group probably 90% of the time. If a seat assignment is that important to you, you shouldn't be flying WN. Just know that other airlines don't guarantee those seats you have been assigned either. If they aren't carrying bags, people won't cough up the money for a slightly larger seat. Plus, the 738s would have it tougher doing interisland than the 712s. I have a feeling that getting seats together won't be too much of an issue on WN HI flights. If you think about it most of the people flying on WN to Hawaii will be families and couples flying together. With this in mind, most of them will take up rows of seats and won't just be looking for window, aisles only as compared to a WN business heavy route like DAL-HOU, etc. So if you are in the low B group or maybe even C, I think that it is likely that you will find seats together, although probably at the back of the plane. WN will do just fine in Hawaii. Inter island will make money because the fare stage length is basically the same as inter California. In addition to pax revenue WN will be running there successful freight product on inter island flights only. Will WN bleed HA to death in a fare war? No. But having serious competition with drive up the demand for inter island travel. In the long run Hawaiian should actually see a increase of traffic going against WN. I think inter island on WN will cap out with 20 flights total within the islands. Last edited by wnflyguy on Wed Feb 06, 2019 5:13 pm, edited 1 time in total. Paragraph 1 - ETOPS is no big deal. Paragraph 2 - ETOPS is a big deal. You do realize that most of our 10,000 pilots have never owned a cowboy hat or lived in Texas, right? (Yes, I get the sarcasm). The crews flying to HI are based in OAK and LAX - many of whom have done plenty of overwater flights either from previous airlines or the military. Last edited by barney captain on Wed Feb 06, 2019 5:20 pm, edited 1 time in total. Just wondering how many test flights can we expect? ...An example of FAA oversight. North America to EGLL on a 777 ETOPS validation flight. Diverted into EINN and the engine required a bore scope for a further service sign off. No 777/RR bore scope tool could be found, and the airline had to charter an airplane and ferry one over to EINN from EGLL so as to pass the validation process. These FAA folks have a wicked imagination at times and if it's the FAA guy I'm thinking of, he will give you fits before it's over. Expect the unexpected best describes how this works. BravoOne, your statements reminded me of a few stories during proving runs. It was a highly educational experience, to say the least (we had some great fun, too). Will never forget this moment! I don't get the hype at all. I hope the people of Hawaii remember who has been serving them all these years and that economic force for their state. I forgot about the cap, however, i have definitely seen some early birds in the late Bs (B16+) unsure how that happened but it did. Did the people of Hawaii refuse to fly AS when they came in because others had be serving Hawaii longer? It's because we've come so far from very modest beginnings - and against many odds. I just wish Herb had lived to see it. Probably a combination of a lot of A listers and a lot of people buying early bird. With Early Bird, I'm often in group B even with it, albeit a low B number. Maybe better to just go to the gate instead and buy the "upgrade" to A 1 - 15...I've never seen that group full. Ah yes how did families with kids ever previously travel without reserved seats on WN? Cal-Hawaii flights aren't any longer than most trans-cons and people with kids fly those every day on WN. I remember back before they had boarding numbers, just an A, B, or C. I would get to the gate in BNA for a quick 70 minute ride up to MDW and if I found all the seats taken in the waiting area, I would simply go stand in the "B" corral for a few minutes while everyone waiting got up and lined up behind me. Then I would go sit down and wait till boarding. If people obsess over seats like this for a routine hour shorthaul I can only imagine the craziness that could ensue for a 6-hour. That being said, I've had many more experiences being separated from family on airlines with assigned seats. It even happened on my first-ever transatlantic flight at the age of 14 with my parents. We all got separated and somehow we all survived. People make a bigger deal of it than it ought to be, and for some, this will be a deal-breaker. With WN going to a variable rate for Early Bird (depending on length and popularity of the flight among other factors rather than just a flat $15 per person each way regardless of flight trip length like it was previously) maybe we'll be a difference in how many people buy it. I’ve read that the napkin never actually happened. It is all urban legend. Rollin King, the man with the plan behind Southwest Airlines in 1966, says now that there never was a napkin. The story of the golden triangle route map drawn out on a cocktail napkin has been immortalized, even in history and training materials put out by the company, and in all kinds of books about the Southwest. 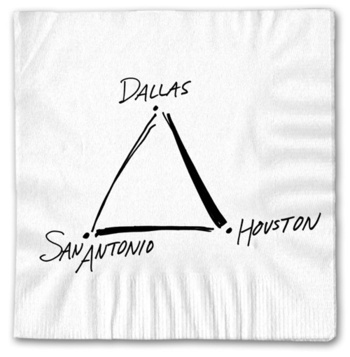 Supposedly, this is why every Southwest Airlines cocktail napkin was printed with the current route map of the period. Last edited by mcdu on Wed Feb 06, 2019 6:22 pm, edited 1 time in total. Because everyone wants to sit next to someone’s kid for 6 hours while they yell for Mom every five minutes. So the option is give up the desirable seat you were able to get to now let mom sit next to the runny nosed kid. Meanwhile you get shoehorned into a middle seat. Yes this is going to make people really happy. No, what they really want is to have to pay extra to be able to select their crappy coach seat and put a carry on in the overhead bin. It's not like this way of selecting seats is new on WN. Most Americans seem to have accepted it considering they carry more domestic passengers than any other airline. I've been to Hawaii dozens of times and never saw a lack o.f Hotel rooms or cars, I always book in Waikiki and I always book with Hertz. I've never missed and I always get a Mustang convertible!! If you are a FF you don’t pay extra to select a E+ seat, you get higher boarding priority included. The ones that don’t get seats are the one off travelers who buy basic economy andthe WN customers that need to get to all those cities WN doesn’t serve. Return flight about to depart. gone! got to see the flash of orange tail lifting off the Reef Runway from the lunch room in our office .. Even if you are a elite FF with UA, you still have to pay for regular economy to be able to get an assigned seat. You can't buy basic economy. They generously also let "WN customers that need to get to all those cities that WN doesn't serve" (which I guess there will be at least two less of now) select a seat if they pay the extra $30ish each way for economy. They will even let you pay $30 to check a bag and $200 to change your ticket too. What a bargain! If you are an elite FF with WN, you get checked in before everyone except BS fares. Unloaded it can probably make it. However won't the 737-7 have the range? WN has 30 of those on order. Actually, you do have to pay extra for E+ on UA, even if you're a 1K (I'm going to assume they'd bend the rules for GS). A Basic Economy fare doesn't allow Premier members to be upgraded into an E+ seat. And where do you get the assigned seat on WN? If one must have an assigned seat, a different airline is a better choice. 135 million paying customers in 2018 would beg to differ. I don’t think the 738 has the range to go HNL-DAL nonstop. The trip is listed at about 3800 miles and the range for that plane is only about 3400 miles. Range is dependent on winds, payload, weather, etc. It's likely not a problem when the cabin has maybe 20 people and there's no luggage or freight.